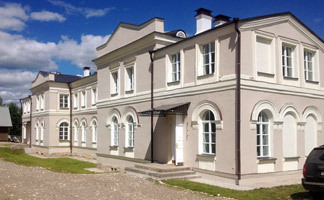 Hvalevskoe manor is located on a high bank of the river Suda, on the outskirts of the picturesque Borisovo-Sudskoe village in the North-West of Vologda oblast. Historically part of the Belozersk region of the Novgorod lands, it belongs to an area often referred to as the "Russian North" (Russky Sever). This manor house was built in 1854-1856 as the main residence for the noble Russian family Kachaloff. Nikolay A. Kachaloff was Head of Customs of the Russian Empire, Governor of Archangelsk region and a trusted ally of tsar Alexander III. 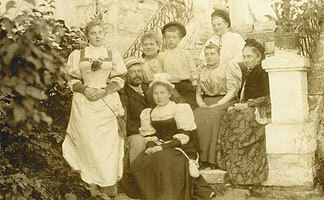 Among the Kachaloff children who grew up at Hvalevskoe, were several prominent members of the Russian society including: Vladimir Kachaloff (builder of Livadia Palace in Crimea and the Massandra Wine Cellars); Nikolay N. Kachaloff Sr. (Governor of Archangelsk, Founder and Director of the Electro-technical Institute - where radio was invented by Popoff); Nikolay N. Kachaloff Jr. (Member of the Academy of Science, Professor, Chief optical glass expert in the USSR) and many others. The family is also related to renowned Russian personalities such as composer Rimsky-Korsakoff, chemist Dmitry Mendeleev and poet Alexander Blok. 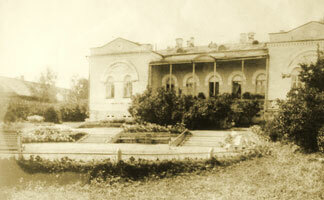 The estate was nationalised after the 1917 revolution. In 2007 the family was invited by the local authorities to visit the manor for the first time and, subsequently, in 2009, the house with its' surrounding land was bought by the Voicehovsky-Kachaloff family, direct descendants of the former owners. Coincidentally around the same time, memoirs of Nikolay A. Kachaloff (the founder of Hvalevskoe) were discovered and subsequently published in 2013 as a 1000-page volume. This unique historical document includes many written accounts of prominent ﬁgures of the Russian society in the second half of the 19th century. The renovation works began in 2009 in both the manor house and the nearby Church of Intercession (Pokrov) built in 1824. The church was closed in Soviet times and re-opened in October 2010. The timber bell tower was erected in 2015. As for the manor house, the major renovation works were completed and the house was blessed in the summer of 2013. That same year, art classes for local children began in the manor. 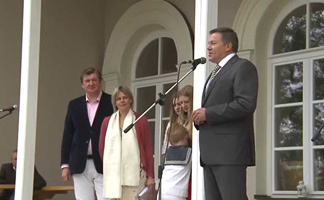 The formal opening of Hvalevskoe estate was in 2014. A small museum exhibition was opened later that year. In 2015, the house and surrounding area were added to the protected monuments register. 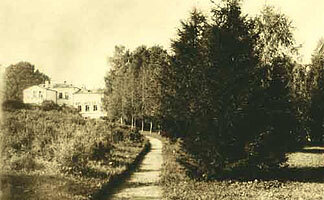 On the Hvalevskoe estate, there is a restored garden surrounded by trees planted during the construction of the manor back in the 19th century. The adjacent former park of 30 hectares is a protected natural area. When the family is away parts of the house are used as an art school, museum and venue for concerts and other events. There are also open-air classical music and folk festivals held here in the summer time. The manor is run as a non-proﬁt charity. For information about visits please contact us via Facebook or write to info@hvalevskoe.com.